Many years ago I heard Nigel Nicolson , the well-known publisher, writer, and friend of many members of the Bloomsbury group, give a talk about his books and some of the famous people he had known. When it came to Virginia Woolf and her sister Vanessa Bell, Nicolson said, (this is not an exact quote) “They always dressed the same way, in long graceful dresses, and every twenty years or so fashion came around to put them in style”. I was struck by how much confidence they must have had to ignore the whims of fashion and dress to suit themselves. This summer, however, I’ve seen two art exhibits that have convinced me their feat would be quite possible. When I was in London at the beginning of July, I went to the Tate Modern to see and exhibit of the art of Sonia Delaunay. 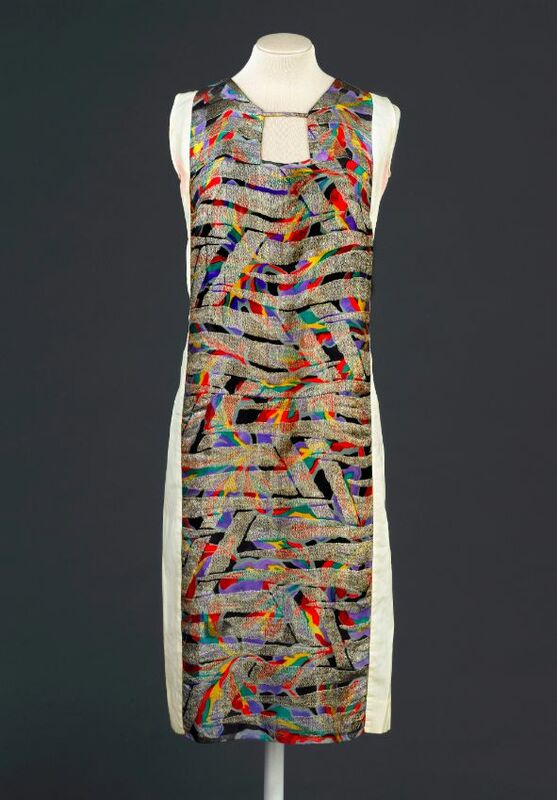 Although I had admired many of her paintings, I had never seen a large exhibition of her work and had no idea that she designed fabrics, dresses, and even magazine covers as well as being a painter. As I looked at some of the clothes she designed, I thought how attractive they would look at a party or public event these days—even perhaps on the red carpet at the Oscars. A woman wearing a dress like the one at the right, would stand out, but would look very fashionable. 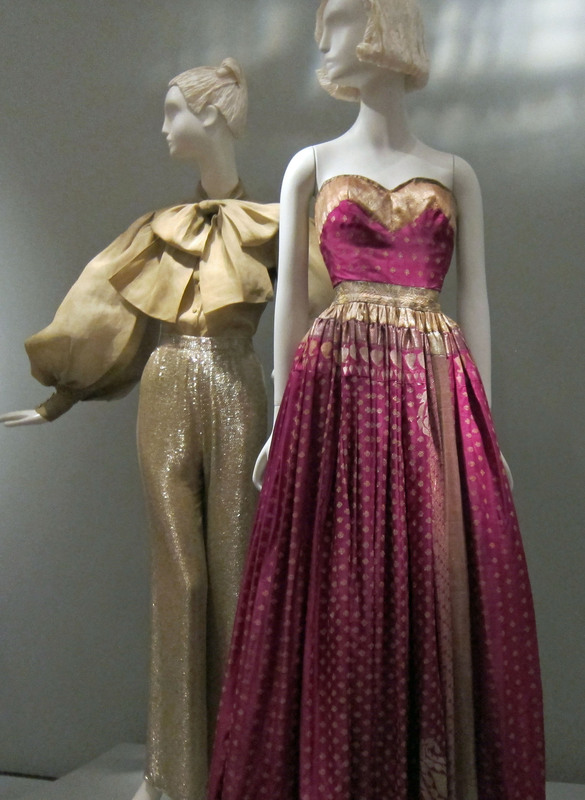 I’ve never been particularly interested in fashion and have spent most of my life wearing the informal clothes that are the usual choice of academics and librarians, but after seeing these two exhibits, I can understand better why there are so many fashionistas in the world. High fashion offers some delightful examples of how clothing can also be high art and add pleasure to the world. I still have some reservations about the excesses, however. 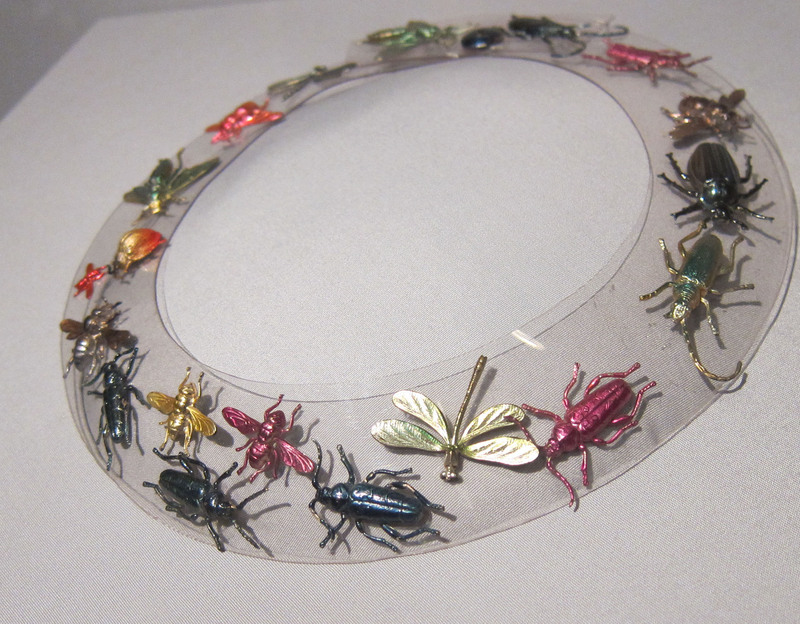 Elsa Schiaparelli’s insect necklace (above) probably goes a step too far for most of us to accept as wearable. It must have been such a feast for the eyes. I rather love that crazy necklace. Thanks for sharing it with us. Yes, that necklace is really something, isn’t it? I wonder how often it was actually worn. Excellent post! Fashion inspires a lot of excess in those who write about it as well as in designers who create it. Your post strikes a note of reason and moderation while also expressing aesthetically sensitive appreciation. Thanks for another inspiring post!